END MILLS have cutting teeth on both end and side, permitting end cutting and peripheral cutting. Center cutting types permit plunge and traverse milling. CUTTING EDGE: Select sharp edged for faster speeds. Select radial edged for longer tool life. SHANK DIAMETER: Select largest diameter available to maximize rigidity and minimize axial deflection and chatter. 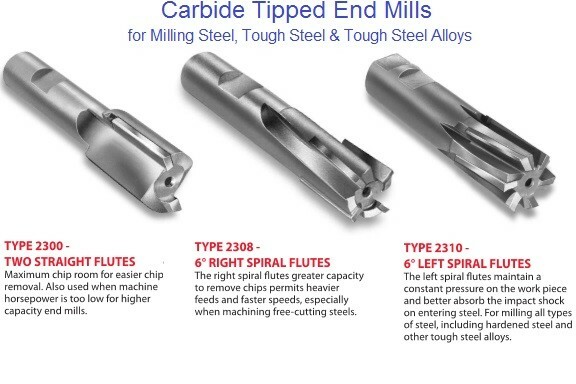 NUMBER OF FLUTES: Select fewer flutes for milling softer materials at higher speeds and feeds where more chip space is required or when machine horsepower is limited. 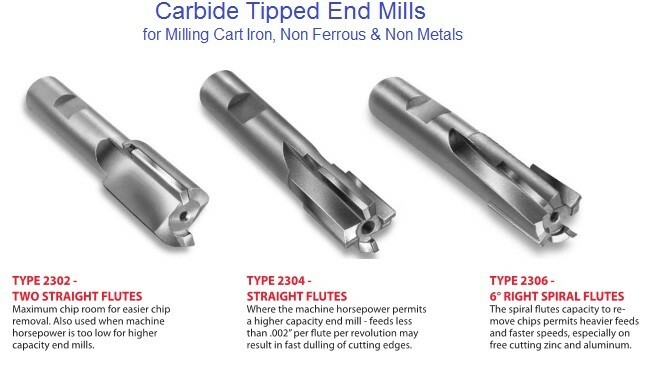 Select more flutes for milling tougher materials at reduced speeds and feeds or for increased table feeds using the same cutting speeds. 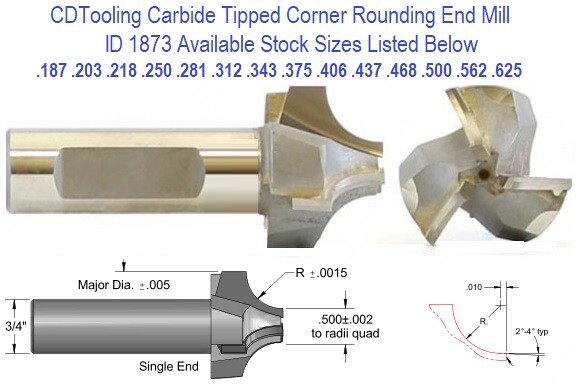 CUTTING DIAMETER: Select largest practical diameter to maximize rigidity, minimize chatter and improve tool life. If machine spindle speed is limited, the largest practical diameter permits higher cutting speeds. FLUTE AXIAL RELATIONSHIP: Select straight flutes for usual general purpose. Select right spiral flutes for improved cutting action and easier chip removal. Select left spiral flutes for use in absorbing impact shock when entering steel work piece maintains constant hold down pressure, and minimizes chatter. Select high spiral (15° or more) to dramatically improve cutting action, finish, chip removal and tool life. High spirals distribute impact load more evenly throughout the tool’s entire revolution. • Intermediate decimal cutting diameter. • Radius corners to improve finish. • Coating to increase cutting speeds and reduce wear. • Undersize shank to accommodate tool holding limitations.